Exira Gamma Knife, a pioneering medical facility in Katowice, Poland, has opened its doors to international patients offering them access to affordable Gamma Knife treatment for brain lesions, tumours and metastases – a highly successful (1) treatment which is often not readily offered to patients and is costly in many countries. A PDF showing a Brain Scan can be downloaded from here. Worldwide, more than 256,000 brain tumours (2)were estimated to have been diagnosed in 2012. Metastatic – or secondary – cancer is the most common form of brain tumour in adults and estimates suggest that between 100,000 and 170,000 people per year are diagnosed worldwide. 20-40% (3) of all cancer patients develop metastatic brain tumours. Exira Gamma Knife is a state of the art facility using the world renowned Swedish Leksell Gamma Knife® Perfexion system. Despite its name, the procedure involves no blade or knife – it is a highly accurate, non-invasive treatment that uses 192 very precise beams of radiation to treat the brain, without damaging surrounding healthy tissue. 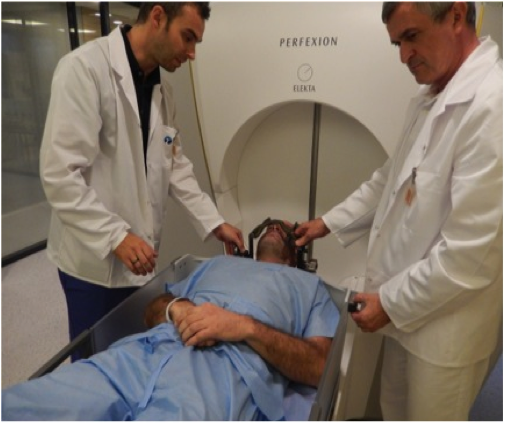 Gamma Knife can be used as an independent treatment or combined with open brain surgery or chemotherapy. The treatment is painless and relatively quick. Complications are rare and patients usually resume their normal routines within 24 hours. Poland is increasingly becoming a destination for medical tourism – around 320,000 international patients in total visited Poland for treatment in 2012. Experienced, expert teams deliver medical care of the highest standard in world-class facilities and yet treatment costs are often between 40-80% lower in Poland compared to other EU countries, the USA or Canada. 4 EU patients may also be able to claim reimbursement for treatment as part of the cross-border healthcare directive. Medical Treatments International Ltd represent Exira Gamma Knife worldwide except in Poland, Russia, Ukraine and all former Soviet Republics (Eastern Europe). Exira Gamma Knife is an innovative medical facility based in Katowice, Poland offering world-class facilities and a highly trained, specialist care team providing state of the art care using the Leksell Gamma Knife® Perfexion technology. The clinic treats patients of all ages, including children.